It sounds so idyllic. You love rosé wine. You love France. So you leave your life in London behind, start flogging rosé to skeptical French drinkers in busy market squares, and hope to learn enough to buy a bar that will specialize in the pink stuff. As Jamie Ivey, his wife Tanya, and friend Peter discovered, however, things are never quite as idyllic as we imagine they might be. Welcome to the June edition of the Wine Book Club, hosted this month by Kori from the Wine Peeps blog. 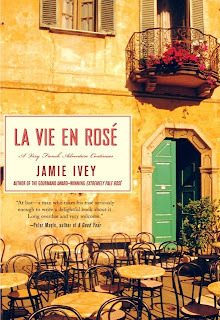 Our book selection for this month was Jamie Ivey's La Vie en Rosé, a book that tells the tale of Ivey's continuing obsession with rosé wines. I enjoyed this book--it was perfect escape reading, and it convinced me that I do not ever want to open a wine bar in France. Getting to experience the highs and lows of the process--from Ivey's halting attempts to communicate with the locals (all of whom know a great deal about wine) to the moment they plunk down money on a piece of property--was like watching friends dive off a very high cliff into formidably deep waters. I appreciated the bravery of what they did, but I have no intention of doing it myself. La Vie en Rosé is full of the sights and sounds of the southern French countryside. From local festivals celebrating garlic to visits with local vignerons, Ivey is adept at bringing a scene to life in all its variety and with a fair bit of humor. My favorite parts were about the reaction that the French had to they Iveys' plans to sell nothing but rosé wine. Some were stunned, many thought the wine would be too expensive to appeal to people used to buying bulk wine from the local co-op, and others were incredulous. In spite of the odds, and in the face of lukewarm success, the Iveys remained committed to their mission to celebrate rosé. The book was less about the wine than it was about French attitudes towards wine and food, and about the difficulties that anyone faces when they try to fit into a new culture. So if you're looking for a book that tells you a lot about rosé wine you may be disappointed. If, on the other hand, you want an up-close account of immersion in French food and wine culture, you will probably enjoy this book immensely. One thing to note: Ivey is British, and this means that his sense of humor is decidedly British as well. His tone may strike some readers as offbeat and ironic. But if you like Peter Mayle's stories of life in Provence, then Ivey's writing style will be right up your alley. This is the kind of book to pack into your bag when you're taking a weekend trip, or just want some pleasant, escapist reading with a wine-related theme. Thanks again to Kori for hosting us and I'll see you back here at the end of July with my reactions to another wine-related book. This month I'm getting to know the wines of Italy's Trentino-Alto Adige region. Tucked up in the northernmost part of Italy, the wines from this part of the country are quite different from the lush southern reds and crisp seaside whites that you might be more familiar with. My first wine was a Cabernet Franc from the southern part of the Trentino-Alto Adige. 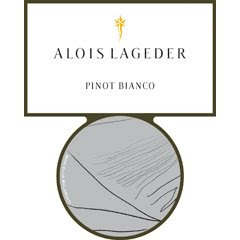 My second wine is an aromatic white from the north: the 2007 Alois Lageder Pinot Bianco from the Dolomites. ($9.39 on sale in my local grocery store; available elsewhere for $13-$17) JPK from The Italian Cellar blog recommended "anything by Alois Lageder" in the comments when I announced my regional focus for June, and all I can say is: JPK's got good taste. 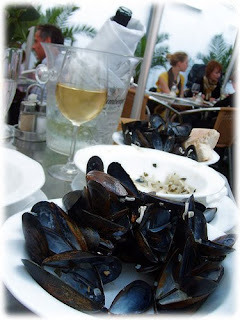 The wine had terrific aromas of salty, wet stone that practically screamed out for seafood. There were salty and yeasty flavors, that turned citrusy and a nicely bitter lemon pith note in the aftertaste. Excellent QPR, even if you don't find it on sale like I did. This bright, bracing wine was excellent with this recipe for smoky citrus shrimp with parsley. The shrimp calls for chipotle powder--which I couldn't find for love nor money up here on the Sonoma Coast. So I substituted a mixture of chili powder, smoked pimenton from Spain, and cayenne and it gave a similarly smoky-spicy kick. Because we were having the shrimp with a hunk of bread and some salad, I also enriched the sauce by whisking a tablespoon of butter into it when it was finish. The wine's salty and yeasty notes were great with the shrimp and bread and the citrus in the wine and the citrus in the sauce were perfect partners, too. Thanks to JPK for the excellent suggestion of Alois Lageder. That's a name that's going on my short list of "go-to" winemakers. That's right, this weekend begins the official start of summer rosé season. Rosé wines are indeed perfect for serving with grilled foods, or drinking chilled on your patio, balcony, or back deck. But they're also great with leftover turkey sandwiches the day after Thanksgiving, or anytime you want to serve a fruity wine that's festive and not pretentious. So check out my recommendations for some of the best rosés available right now--and put aside a bottle or two for this fall and winter when summer will be an all-too-distant memory. You can find them in this week's Serious Grape column, my column on Serious Eats. Enjoy the sunshine. And feel free to leave your favorite rosé recommendations in the comments over there, or below. I was feeling uninspired. There was only one thing I knew for sure--I didn't want Zinfandel. Not that I have anything against Zinfandel. I just wanted something different. So I got on Twitter and asked folks to suggest a grape that might go with this dish. My Twitter sommeliers' suggestions included the following: Rosé, Viognier, Syrah, Malbec, and Sangiovese. You can imagine the rest. I opened up a bottle of each and tried them out with the meal. Dinner proved to be a challenge because the BBQ sauce on the chicken was spicy and slightly sweet. The coleslaw, on the other hand, was earthy and tangy. Here are my tasting notes for the wines I drank, and they include verdicts on the food pairing--and suggested alternatives. 2007 The Crusher Wilson Vineyard Viognier (suggested retail $12.99; available from $11-$16.50) From a partnership between Don Sebastiani & Sons and Clarksburg's Wilson family, huge honeysuckle aromas greeted me on first opening this wine, followed by hay, citrus, and honey flavors. The wine was creamy in the midpalate, with a bright, zingy finish. Very good QPR at $13, but it wasn't a great match with the chicken or coleslaw. It would, however, be sensational with lemon-garlic grilled chicken, or some grilled fish or shrimp. 2007 Dievole Dievolino Toscana IGT (suggested retail $9.99; available for $9-$10) This Sangiovese was bright ruby in color with sour cherry and earthy aromas that are a bit shy at first. The sour cherry and raspberry palate has chalky tannins and an earthy aftertaste. Very good QPR for those looking for a traditional Sangiovese, but it wasn't a great match with the chicken or the coleslaw since these foods tended to accentuate the earthiness and pull the wine out of balance. Instead, think of pairing it with grilled mushrooms or some smoky sausages for a great outdoor dinner. This wine was made from Cabernet Franc grapes and was a lovely salmon pink in color. Honeycomb and raspberry aromas made for an enticing start, and this was followed by a strawberry and raspberry palate. The wine was a hair off dry--so it would be very nice with spicier foods than the chicken I was serving tonight. This wine was the best partner for the coleslaw, too. The fresh berry flavors were a nice counterpoint to the salad's earthiness. Very good QPR. 2007 Substance Malbec (suggested retail, $18; contact the winery for more information) This Malbec from Washignton State's Columbia Valley was excellent. A deep, dark Malbec with blueberry and blackberry aromas, it had a satiny texture and rich, fruit-forward taste with great underlying mineral notes. Nicely peppery aftertaste, too. 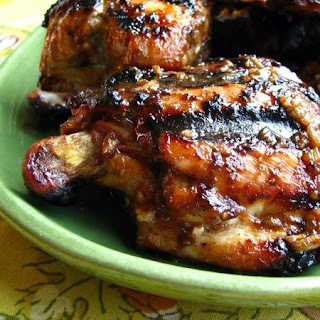 This wine was the best partner for the chicken, and brought out the sweetly spicy BBQ sauce to perfection. Excellent QPR. 2006 Black Sheep Finds Syrah Hocus Pocus ($17.99, domaine547; available for $16-$21) I look forward to the new vintage of this wine every year, and actually managed to hold onto this bottle for a bit to see how it would develop. Though purchased at the end of 2007, it's drinking just beautifully now and has lovely fresh aromas of plum blossom, plum, and berry. Layers of allspice, cinnamon, and a hint of cloves add to the fruit and there is a nicely peppery finish. Lovely example of the grape, excellent QPR for a quality Syrah, and the appellation, and another great vintage from Black Sheep Finds. This wine was the best partner for BOTH the chicken and the coleslaw as it had just the right blend of sweetness and spiciness to marry with the dishes. Thanks to all my friends on Twitter for serving as virtual sommeliers for the evening. It was so much fun I'm bound to do it again. Full Disclosure: except for the Hocus Pocus Syrah, the other wines tasted were samples. But my brain is apparently not wired this way. No matter how much I tried to let the songs lead the taste, instead the tastes led the songs. I kept being inspired to listen to a new song with each sip. The wine that led me on this merry chase through my iTunes library was the 2008 Scholium Project Naucratis from the Slough Vineyards in Clarksburg ($20 in the Spring 2009 allocation; previous vintages available online for $23-$28). It was a perfect choice for Katie's theme--or so I thought. A bit cereberal, a bit off beat, a wine that would reward reflection. Well, yes--but it was also one damn intense Verdelho, with insanely excellent QPR. Which is where I got distracted. There were aromas of banana salt water taffy, sea salt, lime zest, grapefruit, and granny smith apples. The flavors exploded in my mouth in a wash of citrus, tropical fruits, mineral, stone, and more sea salt. 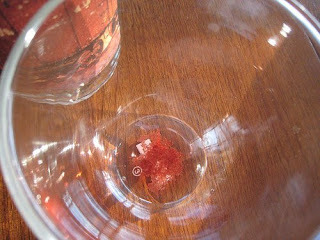 In addition the wine was very dry and quite acidic with a long, lingering aftertaste that hints at a great future. If you want to hear these songs, head over to blip.fm and check them out. I'm there most days playing them, and I've put them all at the bottom of my playlist for you! But in the end, it was the wine that made me hear the music in a new way--I just couldn't get the music to lead my tastebuds when there was this much moxie in the wine. I hope Katie will forgive my feeble efforts. It was a great theme, and I look forward to reading everybody's posts. One of my favorite things about setting the goal of drinking wines from every region in Italy--a process that began in 2008 and will continue through 2009--is that I buy wine I wouldn't taste otherwise. These are often the wines I remember months later because they were unexpected treats, wines that caught my imagination even though I often have low or no expectations and no real frame of reference for what I am tasting. When I opened it, I was greeted with promising aromas of bell pepper, sour cherry, earth, and minerals. It struck me as less weedy than Cabernet Franc from the Loire, with a depth to the cherry aromas that made me eager to taste the wine. Flavorwise, the wine had a lovely, satiny texture wrapped around earth, leaf, and sour cherry notes. This was a really lovely, well-balanced Cabernet Franc from a region that (perhaps in my ignorance) I don't usually associate with Cab Franc. Excellent QPR. Mushrooms go beautifully with a wine with this kind of flavor profile. Make yourself a portobello burger slathered with pesto mayonnaise and topped with roasted peppers and arugula--your tastebuds will thank you. Often overshadowed by Riesling, Gewürztraminers offer wine drinkers food-friendly, aromatic wines that are perfect for seafood, grilled food, and spicy dishes. In short, they're great summer wines. Head on over to Serious Grape to learn more about the grape and to get three recommendations for Gewürztraminers made in the US, in Chile, and in France's Alsace region. And of course,all the wines featured are under $20. Even though both books are about rosé, there's no reason to worry if you haven't read the previous book. La Vie en Rosé tells the story of Ivey's decision to open up a wine bar in Provence that ONLY serves rosé wine. Ivey has a wonderful eye for local color, a real fondness for his French neighbors, and a curiosity about wine that is exemplary. This book is the perfect summer read, good for taking up your time on the morning train to work or for slipping into your carryon when you head out for your vacation. And I think it will especially appeal to all of us who fantasize about doing something--anything!--in the wine biz, as well as to those of you who are already working hard in it and know that it's not all laughs and glamour. So pick up your glasses, get yourself a copy of Ivey's new book, and chill a bottle of rosé with it. I'll be in Europe when the roundup happens, so head over to Wine Peeps for further information on the title, how to alert Kori to your review, and more. Check back here later this month for some rosé reviews to get you in the mood, as well as my book review. And no, I didn't spell it wrong. Rkatsiteli is a new grape to me and I suspect that's true for many of you reading this post. It's the kind of grape that has us all channeling our inner wine geek and scurrying to dig out our Oxford Companion to Wine. When you find your reference books, you'll discover that Rkatsiteli (pronounced "rkah-tsee-tely") is widely planted in eastern Europe, especially in places like Georgia, Bulgaria, and the Ukraine. In Russia, they make fortified wines (akin to Sherry) from the grape, and even turn it into brandy. So how did it get to the Sierra Foothills, which is where the bottling I tasted came from? Rob and Marilyn Chrisman of Avanguardia Wines like relatively unknown and untrodden grapes even more than I do and have specialized in growing and making wine from them since 2004. Avanguardia grows Italian, French, Russian, and University of California crosses like Refosco, Peverella, Forestera, and Rkatsiteli. Some indication of their independent spirit can be seen in this statement from their web site: "As California wines go, our wines are somewhat atypical: we don't produce high alcohol wines, we don't like 'fruit bombs'. Only subtle oak is OK. Acidity is higher than most in order make them food friendly. Balance is everything here at Avanguardia." I've had two of their wines (so far) and they are terrific value and some of the most interesting wine I've had from my home state, so check them out if you're in need of spicing up your cellar. The 2006 Avanguardia Cristallo I tasted recently is made with around 85% Rkatsiteli, with the remainder of the juice coming from Pinot Blanc, Pinot Grigio, and Melon de Bourgogne. (available direct from the winery for $14) With nothing to compare it to in terms of varietal characteristics, I have to say that whether it is "correct" or not I really liked this wine. It smelled of fresh shucked corn--green and creamy at the same time. The palate is creamy, too, but it retains its herbal acidity and freshness, with grassy and floral notes. If you like your wines fresh and zesty, you will think this is a very good QPR pick. If you like your wines fresh, zesty AND geeky (as I do), you will think it has excellent QPR. With your Rkatsiteli, I'd suggest some grilled fish. We had it with grilled halibut with a roasted pepper relish and some green beans with basil. The fresh, creaminess of the fish was a nice pairing for the creamy aspects of the wine, and the wine's herbaceousness accented the roasted peppers. Calling all Rkatsiteli lovers: tell me your experiences with the grape in the comments below. Let's get a Rkatsiteli fan club going, ok? Tucked up against Austria, this wine region is known for its snowy ski resorts, craggy peaks, and its belief that bread and wine is the stuff of life. 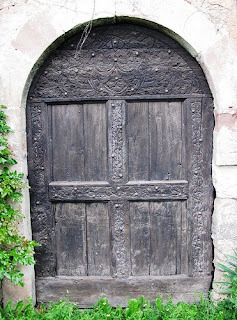 One of the region's proverbs is Pane e vino fanno un bel bambino or "bread and wine make a beautiful baby." The area's dedication to wine is all the more remarkable given the fact that only 15 % of the land is arable, and vineyards often are planted in terraced vineyards on mountain slopes. As the wine goes, so goes the food. In the northern part of the region (Alto Adige) the food has a Germanic flavor and the people are predominantly German speaking--so lots of sausage, cabbage, and dumplings are eaten with hearty reds and acidic whites. In the south, around the city of Trent where Italian is the most common language, polenta and pasta are popular foods, often served with mushrooms. 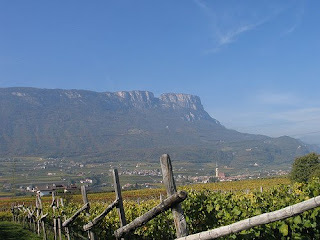 Have you had many wines from Trentino-Alto Adige? If so, what are your recommendations? Check back here for mine over the next few weeks. The first Chianti I ever bought was a bottle of Marchesi de'Frescobaldi Nipozzano Riserva. 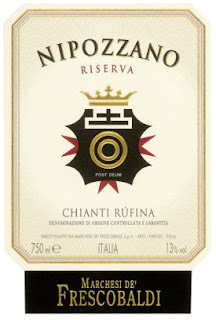 I knew nothing about Chianti--not what grape it was made from, or what the words "Chianti Rufina" meant on the label. Since then I've learned the answer to the first question (Sangiovese) and the second (Chianti Rufina is a particular sub-region of Chianti that is north and east of the main wine-producing area. You can find out more about Chianti Rufina from these articles I found on AbleGrape). And I've also had a lot more Chianti. I like Sangiovese, with its lighter body and earthy flavors. But Chianti prices skyrocketed a while back and I drink less of the wine than I'd like. But wines from Chianti Rufina represent some of the best QPR in this prestigious wine region--as I was pleased to rediscover with the latest release of my tried-and-true favorite. The 2005 Marchesi de' Frescobaldi Chianti Rufina Nipozzano Riserva (available for $17-$28) is an excellent QPR Italian Sangiovese. It had wonderful cherry aromas and flavors that were both fresh and rich. The wine picked up some additional complexity in leather, oak, and spice notes. There was a luscious, juicy aftertaste and the wine had excellent acidity which made it a terrific partner for food. If you're looking for a meal to pair with your Chianti Rufina, try this pasta dish with arugula-almond pesto and meatballs. The arugula and almond pesto will save you some money (at least until the summer basil comes in), and has a wonderful flavor. The meatballs are made with a dash of red wine and two kinds of ground meat. I made the recipe twice--once with the lavender the recipe calls for and once without--and preferred the version without the lavender. Either way the herbal pesto and the cherry fruit in the wine work well together, and the meatballs pick out the leathery, spicy aspects of the wine.